In today's society where integrity and holiness are in painfully short supply, this book is a must-read! 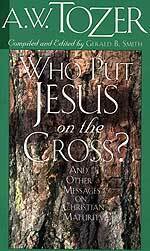 Listen to some of the chapter headings: * Who Put Jesus on the Cross? * Are there Shortcuts to the Beauty of Holiness? * Why Do Men Refuse the Streams of Mercy? * What Is It Costing You To Be A Christian? * What Is The Supreme Sin of a Profane Society? * Will You Allow God To Reproduce Christ's Likeness In You? * Do You Downgrade Yourself Too Much? * Do You Love Your Lord, Never Having Seen Him? * Will There Be Any Lazy Folks In Heaven?